What is the HUMAN HEART and describe their Cardiac Cycle? The human heart is a hard-working pump that moves blood through the body. It pumps its entire blood volume about 5 liters every minute; about 8,000 liters of blood move through 96,000 km of blood vessels daily. The heart of an average adult beats about 70 times per minute––more than 100,000 times per day. The human heart is composed of cardiac muscle tissue that is called myocardium. The outer protective covering of the heart is composed of fibrous connective tissue called the epicardium. Connective tissue and endothelium form the inside of the heart, the endocardium. The left and right halves of the heart are two separate pumps, each containing two chambers (See fig). In each half, blood first flows into a thin-walled atrium then into a thick-walled ventricle. Valves are between the upper (atria) and lower (ventricles) chambers. The tricuspid valve is presen b/w right atrium and right ventricle, and the bicuspid valve is between the left atrium and left ventricle. Collectively, these are referred to as the AV valves— atrioventricular valves. The pulmonary semilunar valve is at the exit of the right ventricle, and the aortic semilunar valve is at the exit of the left ventricle. All of these valves open and close when blood pressure changes when the heart contracts during each heartbeat. The function of valves in veins, heart valves keep blood moving in one direction, preventing backflow. The heartbeat is a sequence of muscle contractions and relaxations called the cardiac cycle. A pacemaker a small mass of tissue called the sinoatrial node (SA node) at the entrance to the right atrium, initiates each heartbeat. Because the pacemaker is in the heart, nervous innervation is not necessary. The SA node initiates the cardiac cycle by producing an action potential that spreads along both atria, causing them to contract simultaneously. The action potential then passes to the atrioventricular node (AV node), near the interatrial septum. From here, the action potential continues through the atrioventricular bundle), at the tip of the interventricular septum. The atrioventricular bundle divides into right and left branches, which are continuous with the Purkinje fibers in the ventricular walls. Stimulation of these fibers causes the ventricles to contract almost simultaneously and eject blood into the pulmonary and systemic circulations. During each Cardiac cycle, the atria and ventricles passes a phase of contraction called systole and a phase of relaxation called diastole. While the atria are relaxing and filling with blood, the ventricles are also relaxed. Then more blood accumulates in the atria, blood pressure rises, and the atria contract, forcing the AV valves open and causing blood to rush into the ventricles. 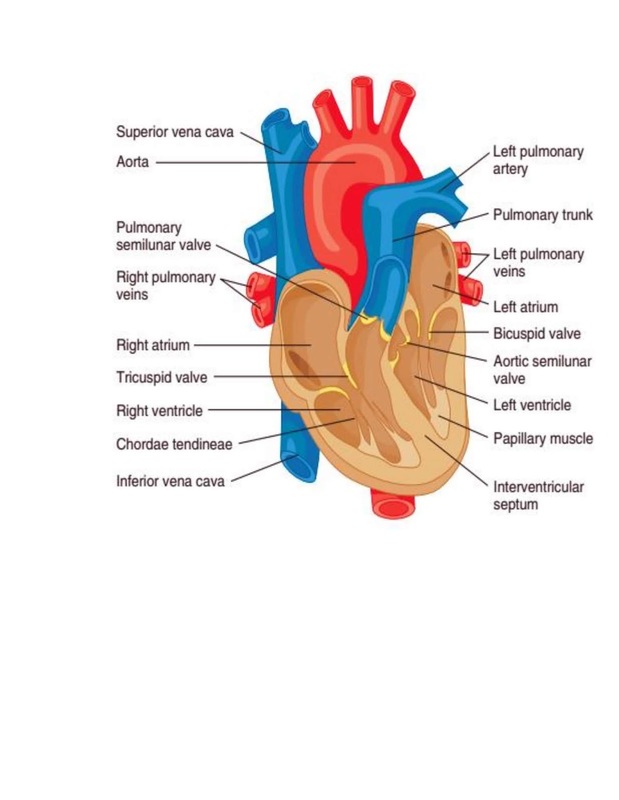 When the ventricles contract, the AV valves close, and the semilunar valves open, allowing blood to be pumped into the pulmonary arteries and aorta. After blood has been ejected from the ventricles, they relax and start the cycle a new. There are two types of circuits the pulmonary and systemic circuits. Pulmonary circuit provides blood only to the lungs. It carries deoxygenated blood from the heart to the lungs, where carbon dioxide is removed, and oxygen is added. It then returns the oxygenated blood to the heart for distribution to the rest of the body. The systemic circuit supplies all the cells, tissues, and organs of the body with oxygen-rich blood and returns oxygen-poor blood to the heart. All vertebrates have a closed circulatory system in which the walls of the heart and blood vessels are continuously contracted, and blood never leaves the blood vessels. Blood moves from the heart, through arteries, arterioles, capillaries, venules, veins, and back to the heart. Exchange between the blood and extracellular fluid only occurs at the capillary level. Vertebrate blood transports oxygen, carbon dioxide, and nutrients; defends against harmful microorganisms, cells, and viruses; prevents blood loss through coagulation (clotting); and helps regulate body temperature and pH. Because it is a liquid, vertebrate blood is classified as a specialized type of connective tissue. Like other connective tissues, blood contains a fluid matrix called plasma and cellular elements called formed elements. Plasma is the straw-colored, liquid part of blood. In mammals, plasma is about 90% water and provides the solvent for dissolving and transporting nutrients. A group of proteins (albumin, fibrinogen, and globulins) comprises another 7% of the plasma. The concentration of these plasma proteins influences the distribution of water between the blood and extracellular fluid. Albumin about 60% of the total plasma proteins, it plays important roles to water movement. Fibrinogen is necessary for blood coagulation (clotting), and the globulins include the immunoglobulins and various metal-binding proteins. Serum is plasma from which the proteins involved in blood clotting have been removed. The gamma globulin portion functions in the immune response because it consists mostly of antibodies. But 3% portion of plasma is consist of hormones, metabolic wastes, traces of many inorganic and organic molecules. The formed-element fraction (cellular component) of vertebrate blood consists of erythrocytes (red blood cells; RBCs), leukocytes (white blood cells; WBCs), and platelets (thrombocytes) (White blood cells are present in lower number than are red blood cells, generally being 1 to 2% of the blood by volume. Red blood cells vary dramatically in size, shape, and number in the different vertebrates. The RBCs of some vertebrates are nucleated, and mammalian RBCs are enucleated (without a nucleus). Some fishes and amphibians have enucleated RBCs. Some vertebrates such as the salamander has the largest RBC. Avian RBCs are oval-shaped, nucleated, and larger than mammalian RBCs. Among birds, the ostrich has the largest RBC. Most mammalian RBCs are biconcave however, the camel and llama have elliptical RBCs. The shape of a biconcave disk provides a larger surface area for gas diffusion than a flat disk or sphere. Almost the entire mass of a RBC consists of hemoglobin, an iron-containing protein. The major function of an erythrocyte is to pick up oxygen from the environment, bind it to hemoglobin to form oxyhemoglobin, and transport it to body tissues. Blood rich in oxyhemoglobin is bright red. As oxygen diffuses into the tissues, blood becomes darker and appears blue when observed through the blood vessel walls. However, when this less oxygenated blood is exposed to oxygen, it instantaneously turns bright red. Hemoglobin also carries waste carbon dioxide from the tissues to the lungs (or gills) for removal from the body. White blood cells are those blood cell that destroy microorganisms at infection sites, remove foreign chemicals, and remove debris that results from dead or injured cell. Among the granulocytes, eosinophils are phagocytic, and ingest foreign proteins and immune complexes rather than bacteria. In mammals, eosinophils also release chemicals that counteract the effects of certain inflammatory chemicals released during allergic reactions. Basophils are the least numerous WBC. When they react with a foreign substance, their granules release histamine and heparin. Histamine causes blood vessels to dilate and leak fluid at a site of inflammation, and heparin prevents blood clotting. Neutrophils are the most numerous of the white blood cells. They are chemically attracted to sites of inflammation and are active phagocytes. The two types of agranulocytes are the monocytes and lymphocytes. Two distinct types of lymphocytes are B cell and T cells, both of which are central to the immune response. B cells originate in the bone marrow and colonize the lymphoid tissue, where they mature. T cells are associated with and influenced by the thymus gland before they colonize lymphoid tissue and play their role in the immune response. When B cells are activated, they divide and differentiate to produce plasma cells. Platelets or thrombocytes are disk-shaped cell fragments that initiate blood clotting. When a blood vessel is injured, platelets immediately move to the site and clump, attaching themselves to the damaged area, and thereby beginning the process of blood coagulation. Arteries are elastic blood vessels that carry blood away from the heart to the organs and tissues of the body. The central canal of an artery (and of all blood vessels) is a lumen. Surrounding the lumen of an artery is a thick wall composed of three layers, or tunicae. present. The valves permit blood flow in only one direction, which is important in returning the blood to the heart. Arteries lead to terminal arterioles (those closest to a capillary). The arterioles branch to form capillaries (L. capillus, hair), which connect to venules and then to veins. Capillaries are generally composed of a single layer of endothelial cells and are the most numerous blood vessels in an animal’s body. An abundance of capillaries makes an enormous surface area available for the exchange of gases, fluids, nutrients, and wastes between the blood and nearby cells. 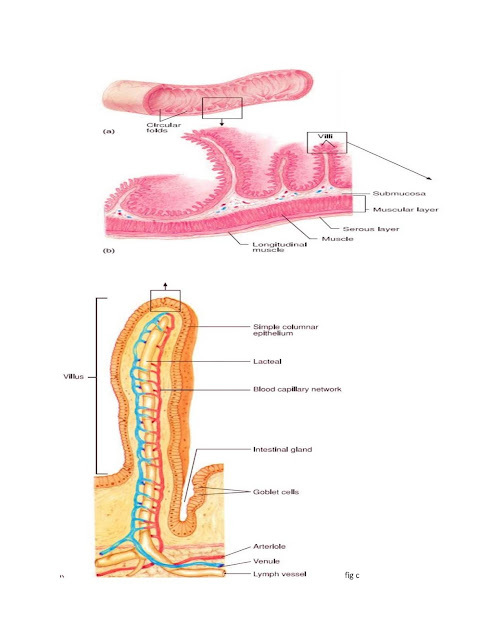 Some animals e.g., echinoderms, annelids, sipunculans use coelomic fluid as a supplementary or sole circulatory system. Coelomic fluid are identical to interstitial fluids or some time differ from this fluid, particularly with respect to specific proteins and cells. 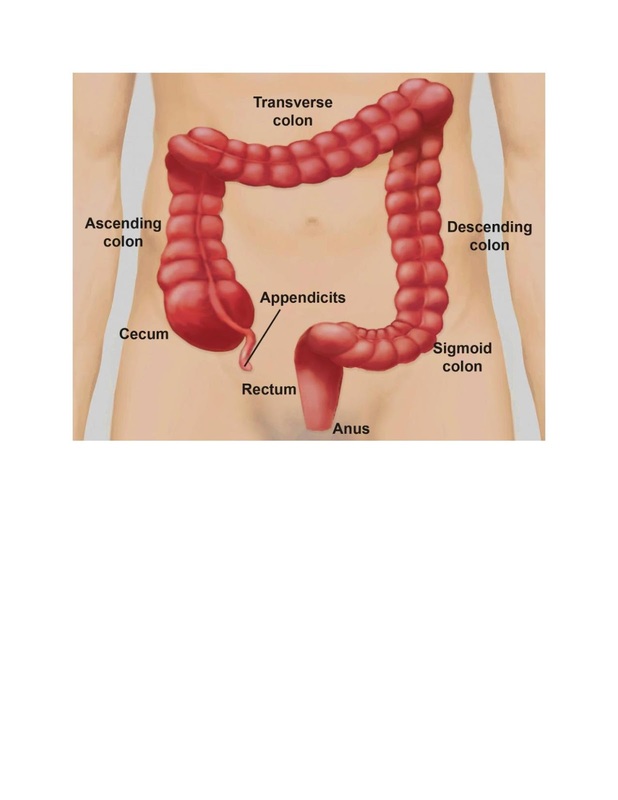 Coelomic fluids have the role to transports nutrients, and waste products and gases,. It have function in certain invertebrates (annelids) as a hydrostatic skeleton. Hemolymph is the circulating fluid of animals with an open circulatory system. Most arthropods, ascidians, and many molluscs have hemolymph. These animals hve function to a heart pumps hemolymph at low pressures through vessels to tissue spaces and sinuses. Hemolymph have high volume and the circulation slow. In the process of movement, essential gases, nutrients, and wastes are transported. Many times, hemolymph has noncirculatory functions. For example, in insects, hemolymph pressure assists in molting of the old cuticle and in inflation of the wings. Some jumping spiders have hydrostatic pressure of the hemolymph that provides a hydraulic mechanism for limb extension. The coelomic fluid, hemolymph, or blood of most animals contains circulating cells called blood cells or hemocytes. Some cells contain a respiratory pigment, such as hemoglobin, and are called erythrocytes or red blood cells. These cells are usually present in high numbers to facilitate oxygen transport. Cells that do not contain respiratory pigments have other functions, such as blood clotting. The number and types of blood cells vary dramatically in different invertebrates. For example, annelid blood contains hemocytes that are phagocytic. The coelomic fluid contains a variety of coelomocytes such as amoebocytes, eleocytes, lampocytes, linocytes that have the role in phagocytosis, encapsulation, defense responses glycogen storage, , and excretion. Insect hemolymph contains large numbers of various hemocyte types that function in phagocytosis, encapsulation, and clotting. 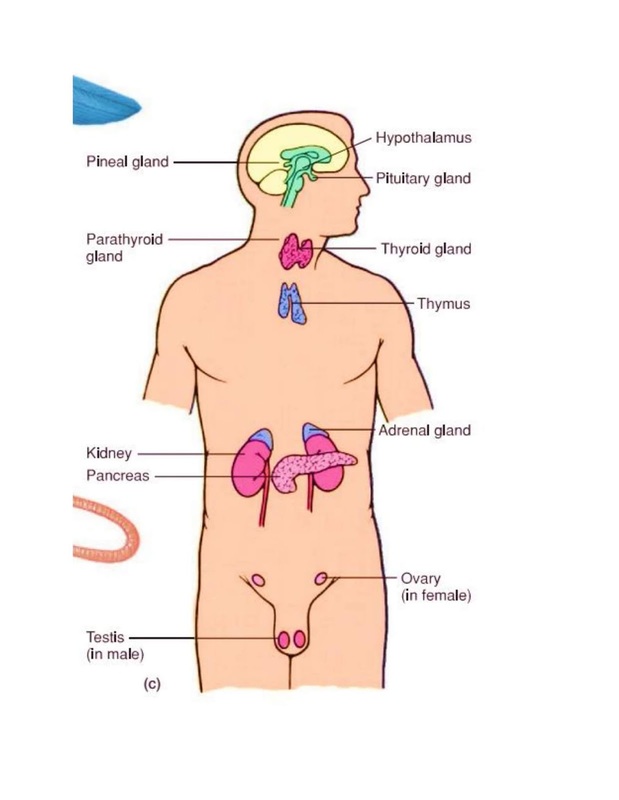 Endocrine systems of vertebrates and their hormones. Endocrine system of vertebrates are more complex than invertebrates animals. 1. Hormones (or neuropeptides) with the same function in different species may not be chemically identical. 2. Special hormones are species-specific according to their function that conversely in some hormones produced in one species may be completely functional in another species. 3. A hormone from one species may responses a different functions in the same target cell or tissue of a different species. 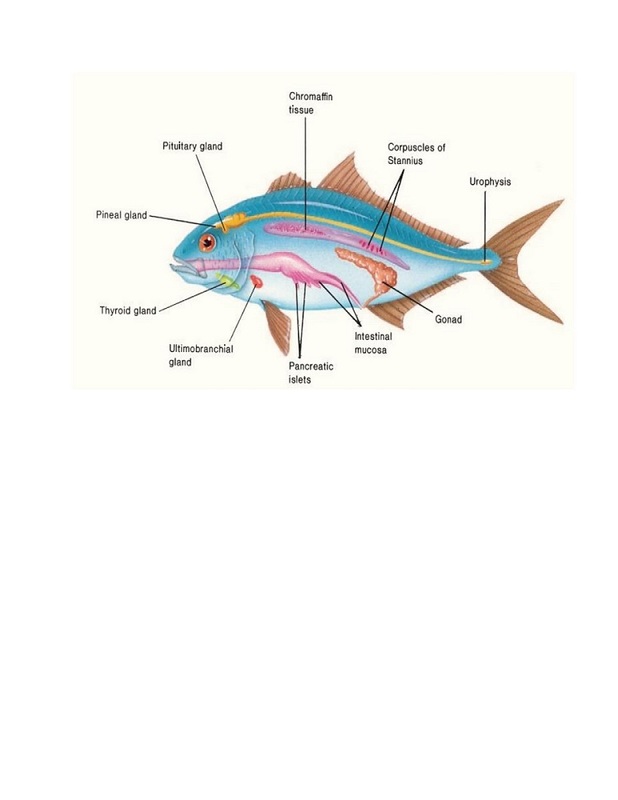 The brain and spinal cord of fishes are produced more complex hormones, with other glands being rudimentary (see figure ). Three major regions in jawed fishes secrete neuropeptides. The two are present in the brain that are the pineal gland of the epithalamus and the preoptic nuclei of the hypothalamus. The neuropeptides hormone that produced by the pineal gland influence the certain tissue pigment and inhibit reproductive development, both of which are stimulated by light. Pineal glands also produces,the melatonin hormone, has major effects on body metabolism perform activity patterns at the same time with light intensity and day length. The preoptic nuclei produce different other type neuropeptides that control different functions in fishes for example, growth, sleep, locomotion. The third major region of fishes that has neuropeptide function is the urophysis. The urophysis is a distinct structure that are present in the tail of spinal cord. The urophysis produces hormone neuropeptides that help blood pressure, control water, ion balance, , and smooth muscle contractions. In many fishes, , hormones (e.g., melatonin) from the pineal gland control variations in skin color. When this hormone produced by one species is injected into another species, it can induce immediately color changes (see figure). 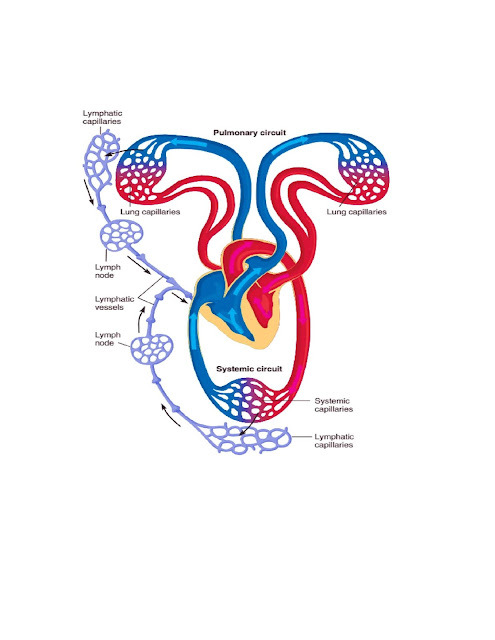 Hormone prolactin that also produced by the pituitary gland. Prolactin stimulates reproductive migrations in many animals (e.g., the movement of salamanders to water). Prolactin causes brooding behavior in some fishes. That control water and salt balances, and is essential for certain saltwater fishes to enter freshwater during spawning runs. controle the concentration of blood calcium. Specialized endocrine cells (chromaffin tissue) or glands (adrenal glands) that lie near the kidneys and ready thesome vertebrates for stressful emergency situations. 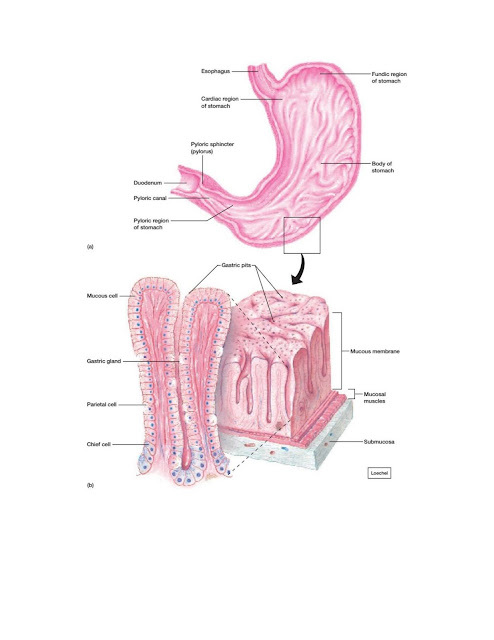 These tissues and glands produce two hormones epinephrine or adrenaline, and norepinephrine or noradrenaline that cause vasoconstriction increased blood pressure, changes in the heart rate, and increased blood glucose levels. These hormones are involved in the “fightor-flight” reactions.
. 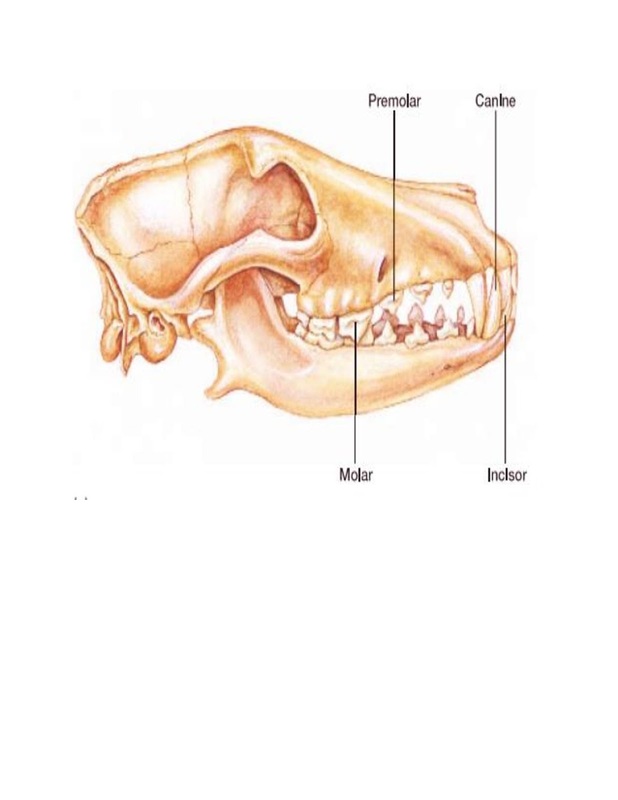 The brood patch helps keep the eggs at a temperature between 33 and 37° C.
The endocrine glands of birds contain the following part of hormone of the pituitary, thyroid, pancreas, parathyroids, pineal, hypothalamus, ovary, testes, adrenals, thymus, ultimobranchial, and bursa of Fabricius. 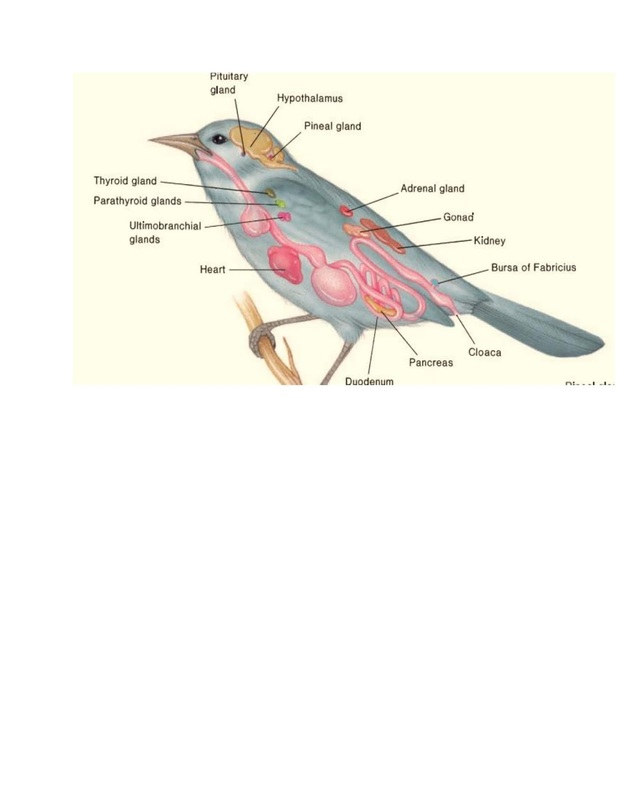 The bird’s thyroid gland produces the hormone thyroxine. Thyroxine regulates molt cycle, normal development of feathers and plays a role in the early stage of migratory behavior. In male birds, the testes produce the hormone testosterone. Testosterone controls the 2nd sexual characteristics of the male, such as, spurs, bright plumage color, comb and —all of which strongly influence sexual behavior. 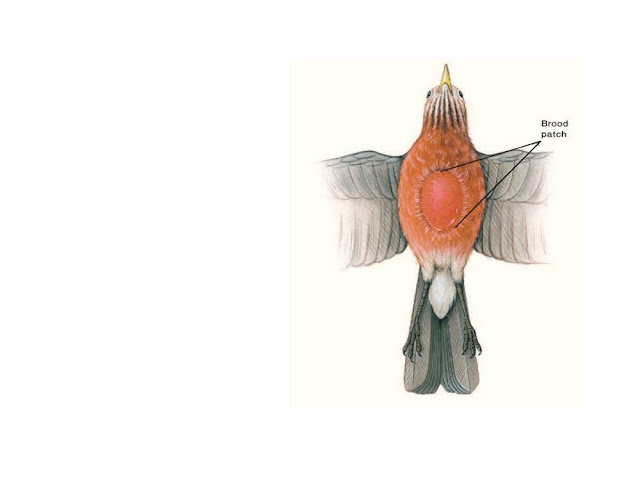 Dorsal of the cloaca have is a sac like structure of bursa of Fabricius that just lies it. . During the bird’s embryological development, it start to begins to shrink and than after hatching. Its tissues produce secretions that are responsible for the maturation of white blood cells (B lymphocytes), which play an important role in immunological reactions. The ultimobranchial glands are small, paired structures in the neck just below the parathyroid glands. They secrete the hormone calcitonin, that perform the function to regulate blood calcium concentrations.